» Full $1.8 billion project will extend further southeast as well as northwest to North Carrollton. It’s the weekend of Green Lines. Yesterday, as Portland was celebrating its light rail extension along I-205 to Clackamas County, Dallas previewed the first 2.7-mile segment of its new transit corridor, which will provide rail links to the southeast side of the city for the first time in decades. Revenue service begins tomorrow. The full line, running 28 miles from Carrollton to Buckner, will open for customers in December 2010. 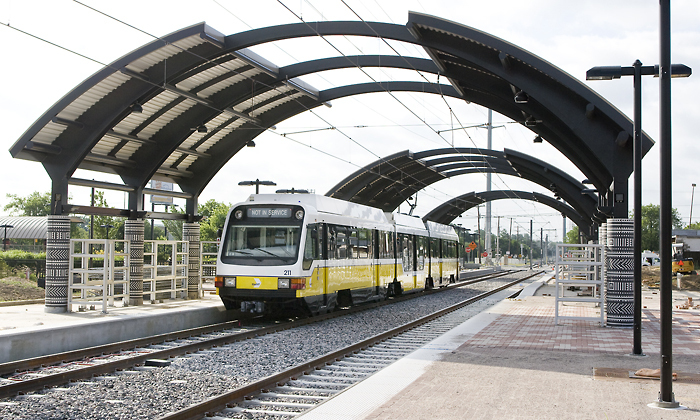 Dallas has one of the most ambitious rail programs under development today, with a new Orange Line planned to reach the airport in 2013, a circumferential Cotton Belt Line running around the north side of the city, a west Dallas corridor, and further extensions of the Red, Blue, and Green lines. 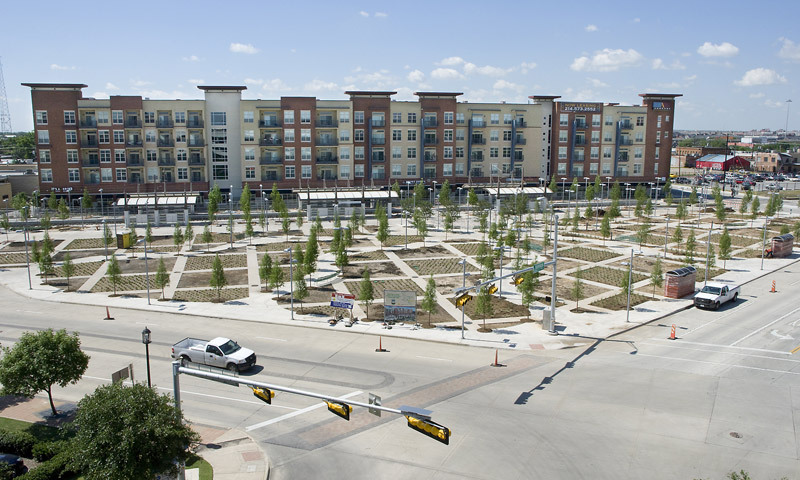 But the first phase of the Green Line may be one of the most important, as it connects some of the city’s most important assets directly to the central business district, including Baylor University Hospital and the state fairgrounds. The Green Line provides the spine for the Orange Line, which will share the former’s route until Bachman station, where it will split off to the west. The two new lines will add a total of 45 miles to the DART light rail network and an estimated 60,000 daily riders, to 120,000 systemwide. 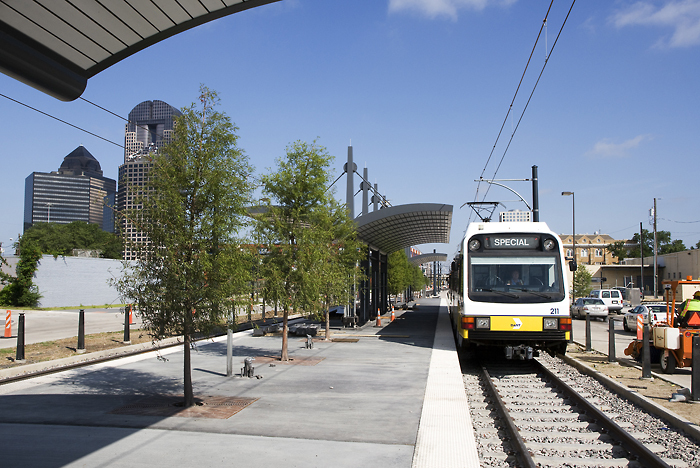 Unlike Portland’s corridor, the Dallas Green Line runs in its own right-of-way adjacent to minor city streets, rather than a huge highway. This slows speeds a bit, since trains will have to go through intersections, though traffic lights will be automated to stop cars before trains pass through. On the other hand, the project’s routing will maximize surrounding development opportunities and make walks to and from the station convenient and comfortable, ultimately increasing ridership. Stations are generally well linked to nearby buildings and parks; each is unique in design and some even include fantastic sculptures. It says something really good about Dallas when it is building its rail lines more effectively than is Portland. Even so, stations further down the Dallas line still under construction are less interesting, more oriented around parking lots than neighborhood connections. The project is especially consequential for the revival of the Deep Ellum neighborhood, which was the city’s underground arts center for much of the 1990s, but which lost some of its appeal as crime increased and arts-oriented businesses were replaced by clubs. The community has recently seen increasing investment in the form of high-density residential buildings along the line, and several old warehouses are being renovated for new use. The rail line could spur new vitality. Further down the line, the inhabitants of the poor, mostly black areas around and south of Exposition Park are excited to see increased mobility coming their way. Too much excitement over the line, however, could be problematic, causing gentrification and increasing housing prices — and leading to the less weathy having to move out. Even so, with the entire Dallas region to benefit from new lines over the next few decades, this fear seems unlikely to come to fruition, so the Green Line is probably all-in-all a good thing. 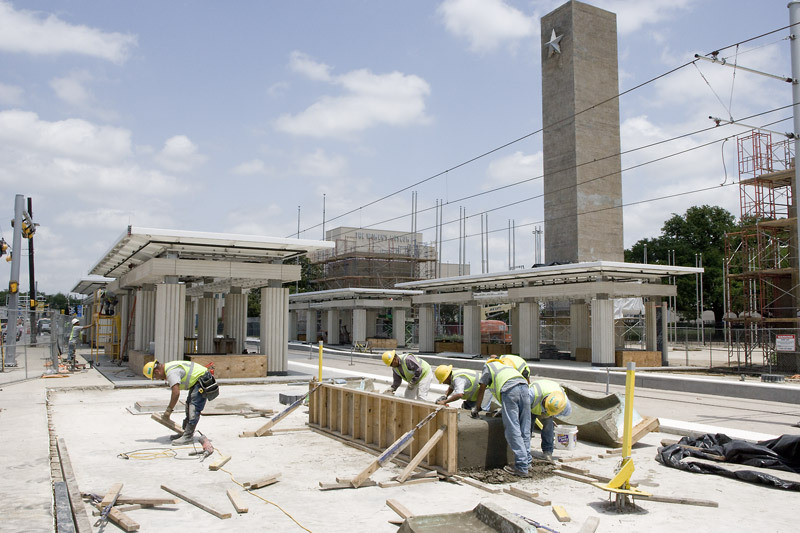 The project’s opening will put added stress on Dallas’ downtown light rail route, which is already used by the Red and Blue Lines and runs on Pacific Avenue and Bryan Street. With the addition of the Orange Line and the eventual creation of a West Dallas corridor, the city will need a new route downtown to handle the number of trains. No problem: planners recognize this issue and have already allocated hundreds of millions of dollars for a second downtown corridor, complete by as early as 2014. Note: See Human Transit for a discussion of the right place to route rail lines; See Rebuilding Place in the Urban Space for a discussion of designing for beauty in transit systems. As you have said before Yonah, land use is an important, perhaps the most important, goal of mass transit. And although Dallas may be routing their new line through existing neighborhoods, Portland has been proactive about land use for the past 30 years and it shows. On the southeast side, which is the quadrant where the new green line is, there is already TOD-like neighborhoods that don’t even have light rail. There are major bus lines running through neighborhoods like Hawthorne, Belmont, and Division, but transportation is provided by cars, buses, and bikes. There’s local streets like Clinton that are centered on bike boulevards, and they could almost be considered bike-oriented development. Few areas like that exist in Dallas. Most of the Metroplex is astonishingly unfriendly to pedestrians, and up until recently even Dallas was not very interested in mass transit. Biking is unpleasant to say the least, and despite the redevelopment of places like Uptown in Dallas or West 7th in Fort Worth there is very few (if any) places in the whole Metroplex that are conducive to living without a car. And the Metroplex is….really big. So that’s like 10 million cars there. Not disagreeing with the post. I love that Dallas is investing in transit and someday that may convince me to return to the Metroplex. I just wanted to add in a little perspective. Plans for that second downtown corridor look disappointing to me. four alternatives are presented — shortest, longish, long, and even longer. The shortest route will have two new stations, the others only three each. Apparently no consideration was given to a four- or five-station option. More and closer stations would let DART work here like mass transit, moving people within the inner city. But no, it’s a system for suburban commuters and looks like it intends to remain just that. What would you suggest for the downtown corridor alternatives? On the 3-station routes it appears that the proposed stations would be 1500-2000 feet apart. That seems quite close together already. But yes, overall it is a system for suburban commuters. I’m Texan, but no expert on Dallas. But when I look at the aerial photo/map, the existing yellow Downtown line has four downtown stations below I-45. They appear to be much closer together than any of the stations on the suggested new routes. I guess I’d vote for the orange line, or the purple one. (And I sort of like the blue loop added to what I gather is a proposed convention center hotel on a vacant lot.) I’d want to bring more territory within a walkable distance of DART, and maybe infill the green line in the future to make for more of a mass-transit type system in the Downtown. But when I look at the station dots, hunh? The purple variant would have a station near I-45, but none of the others. I’d figure, either the area needs a station, or it doesn’t. So why not put that station on the orange line too? Then move the next orange line station closer to the next station marked on the purple line. Really, why are these stations on the purple and orange lines so helter skelter? The lines are one block apart, but the stations have no obvious relationship to the surrounding streets and buildings, and certainly none to each other. What is that huge rooftop between I-30 and the blue loop (with the yellow line going under it)? Could that be the Convention Center? Nobody there will be looking for a DART station? Just from looking at the size of the whatever ‘it’ is, I’d put the blue loop station closer to the huge ‘it’. Then I’d want a station on Lamar between ‘it’ and the yellow line. That gives me potentially five stations using the orange or purple lines with the blue loop. I think they’d work out to be about the same distance apart as those on the yellow line through the heart of Downtown. I could live with four. But only two or three stations doesn’t make sense to me. I agree with your observation that the “suggested” stations are all helter skelter. Young/Griffin (or Lamar) for the Convention Center hotel & federal bldg (and the new Aloft hotel ;). I don’t think there’s a compelling reason to have a station right next to I-45. The other issue is that these lines are currently planned to have sections both at-grade and underground, so engineering complications arise between the various options. Also, the purple line is currently estimated to be the least expensive to build. Yes, that big “it” is the convention center. There already is a convention center station underneath it on the yellow line (which actually serves both the RED and BLUE trains, but is yellow on this map). The primary rationale for the blue line is to swing by the to-be-built convention center hotel, but as you can see it’s just a giant parking lot right now. If there’s no compelling, big traffic-generating workplace, school, or civic building to call for an adjoining station, then the helter skelter placement of stations on the competing route based on simpler engineering and lower cost makes good sense. I still sort of like that blue loop to go past the Convention Center itself as well as its proposed hotel. Looks like ‘it’ could use a second station, especially as the overall system expands to connect to Southwest Airlines’ hub at Love Field and eventually to DFW. And couldn’t that loop work off your favorite purple line with a tweak or two? But then, maybe two stations could confuse out-of-town riders. In this case, one short two-station option competes with three longer options. If the powerful person or body counting the votes wants a longer route farther away from the heart of Downtown, they can add together the votes for those three options and declare that to be the public’s preference. If they want the short route, it will probably win a plurality while the longer route votes are split, thus it can be declared the most popular way to go.